Syrefritt bomullspapir med meget god coating. Høy svertning og stort fargerom til å være ett matt papir. Litt (2) OBA. Ligner på Hahnemühle Photo Rag. A 100% cotton rag paper with a classically smooth matt finish and a highly calendered surface. 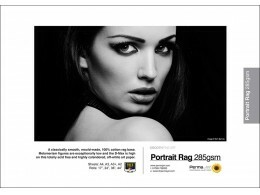 Its 285gsm, acid-free base is perfect for archival standard fine art photography reproductions or high key portraiture. Smooth skintone detail is a particular feature of this media whether you use pigment or dye inks. Its medium white base coating produces excellent tonal definition, Dmax and wide colour gamut. This has become the social, wedding and portrait photographers stock product. Metamerism figures are exceptionally low and the Dmax is amongst the best figures recorded - making this a paper you just have to try!